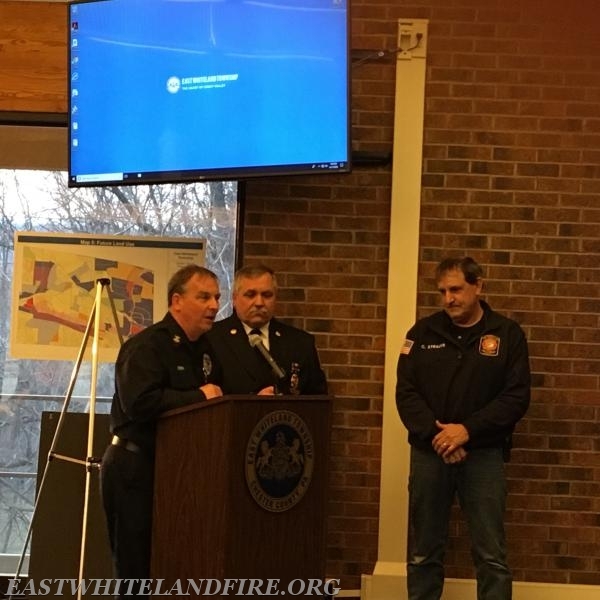 On April 11th, 2018, Battalion Chief Chris Strauss of the East Whiteland Fire Company was recognized for his years of service with the Pa. Forestry Department. Battalion Chief Strauss serves as the local Forest Fire Warden. He was recently awarded a certificate of appreciation for twenty five years of service by the forestry service. This recognition award was presented to him at the East Whiteland Township Board of Supervisors meeting. Left to right is Deputy Director of Life Safety Matt Fink, East Whiteland Fire Company Fire Chief John DeMarco and Battalion Chief Chris Strauss. Congratulations to Battalion Chief Strauss for his years of dedication and service.